Contact us Monday through Friday, between the hours of 7 a.m. and 4:30 p.m. at (937) 775-4444. Outside of these hours, contact the Wright State police by calling (937) 775-2111. Have a custodial/recycling request or concern? For immediate assistance, contact us at (937) 775-4444 to place a work request or a chargeable service request, or submit a work request. We are responsible for providing chalk, dry erase markers, and erasers to all classrooms. Supplies are replenished between 4 and 8 a.m. Monday through Friday. If you need supplies between the hours of 8 a.m. and 4:30 p.m., contact us at (937) 775-4444 or retrieve your needed item from the classroom supply cabinet at one of the locations listed below. Note: When a marker goes bad, please dispose of it in the trash. If supplies are needed after 4:30 p.m., please retrieve your item from a classroom supply cabinet or contact the CaTS Help Desk at (937) 775-4827. Professors may request a cabinet key by completing a key request and submitting the request to the lock shop. All general cleaning is performed 4 a.m. to 12:30 p.m., Monday through Friday. 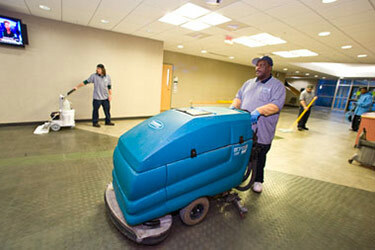 We complete spot cleaning limited staff from 12:30 p.m. to 12:30 a.m. Floor work and special projects are completed from 4 p.m. to 12:30 a.m.
We complete exterior window cleaning on an annual basis. Office interior window cleaning is charged to each department. To place a request for price quote or service, contact us at (937) 775-4444. We currently do not charge for event coverage during normal work hours. Services needed during non-scheduled work hours or that require dedicated staff during the event are charged back to the department or office. To request services, please contact us Monday through Friday between the hours of 7 a.m. and 4:30 p.m. at (937) 775-4444. 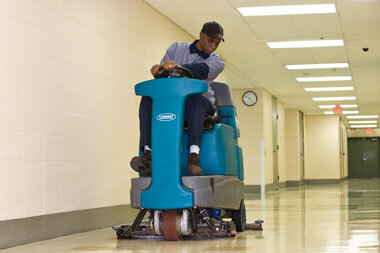 We have 12 primary floor care technicians dedicated to daily floor maintenance (corridors/tunnels/large common areas) and special projects on main campus. Hours of operation are 4 p.m.–12:30 a.m., seven days per week, with limited staff on weekends. Wright State contracts with ScherZinger Pest Control. Buildings are serviced a minimum of once monthly, usually the third Wednesday of each month. If you place a pest control request with us, ScherZinger will be called immediately and will usually respond within 24 hours. Please remember to leave your name and number so that ScherZinger can contact you. We use a co-mingled recycling program where all acceptable recycling materials can be disposed of into one container. Containers are easily identifiable with waste on the left and recycling on the right. Cardboard is baled and transported to Rumpke Recycling for cash revenue. Outside campus has been equipped with 75 waste/recycling containers visible and accessible to pedestrians. Waste/recycling containers can be found in common hallways near vending areas. Recycling boxes can be found in office break room or file room areas. As funding becomes available, additional recycling containers will be purchased for auditorium and classroom settings. Request a recycling tote for an office clean-out. Request a confidential material tote. These totes are locked at all time, remain in a secure location until they shredded. Help us increase our recycling efforts! Request a recycling tote today. Convert all office waste into recycling. Use desk waste can for recycling. Designate one office suite container for waste. Remove desk can liner (everything but food should be recycled). Set the example and spread the word to recycle. Have questions regarding acceptable items? Contact Gina Reese, custodial service manager at (937) 775-4132. What if my department has something to be disposed of that is not on the list of recyclable materials, but we don’t want to put it in the waste stream? Contact ESPM to see if it could be sold. If it cannot be sold through ESPM, call Physical Plant at (937) 775-4444. Someone will contact your department to set up a time to evaluate the material. What is the procedure for recycling confidential material? Confidential files are of great concern to Wright State University. Materials must be handled in accordance with federal and state privacy regulations. Therefore, Physical Plant provides locked confidential containers strictly for this purpose. Once filled, locked containers will be picked up from your area and transported to a secured area on campus for shredding. To request a confidential tote, contact the Customer Service Center at (937) 775-4444. What is the procedure for office clean-outs? If your office is planning a clean-out, or you need to empty your file cabinets, request a recycling tote for old papers, books, files, etc. As these containers become extremely heavy, we ask that you only fill them ¾ full. To request a recycling tote, contact Customer Service at (937) 775-4444. Whom should I contact if I have material to be picked up, or if I need more containers? If the recycling bins in your area are full, you have something too large to fit into a recycling station bin, or for more recycling containers, call Physical Plant at (937) 775-4444. Do I have to separate different types of paper, plastic, and glass materials? All approved recyclable materials may be combined in the recycling bins. These materials can be co-mingled in these bins and are disposed of in the Wright State recycling compactor then picked up and source separated at the recycling plant by Rumpke. 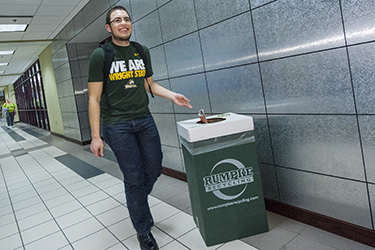 Does Wright State University accept waste or recycled materials brought from home? The answer is "NO" due to the fact that WSU pays to have all waste and recycling removed from campus. We take preventive measures to disinfect high-contact points throughout campus. We have 200 waterless hand sanitizers throughout Dayton campus and off-site locations by vending areas, elevators, recreation areas, and 24-hour labs. If requested, disinfectant wipes are available to professors for student use in classroom computer labs for disinfecting of keyboards and computer mice. Please do not use wipes on computer screens. What is green cleaning? It is cleaning in a manner that protects health without harming the environment. What is LEED? It is Leadership in Energy and Environmental Design, a building rating system and nationally accepted benchmark for the design, construction, and operation of environmentally sustianable buildings. We collaborate with Greene County Educational Service Center, a vocational skills training program for high school students with disabilities who are in their last two years of high school to help prepare these students for today's workforce through the direction of a job coach. At the beginning of the school year, these students are welcomed by receiving lockers, training, tools, equipment, and education on their importance to Wright State. Students assist with confidential shredding and disinfecting high-contact-point areas. For persons interested in accessing student trainees at your worksite, contact Kristin Irwin, Greene County Schools Transition Coordinator, (937) 767-1303, ext. 4310 or gcbo_kirwin@k12server.mveca.org.